Mike Cook is occupied with writing the last 25 years of the guilds history and so has relinquished the model reporting role having been our main scribe for most of that period. In future reporting the meetings will be shared by two reporters at each meeting. This time it was the turn of Colin Bull and Richard Smith – many thanks to both for stepping up to the plate. I hope you enjoy their summaries – please make the job of reporters easier by doing a write up of your models and preferably emailing to the secretary. 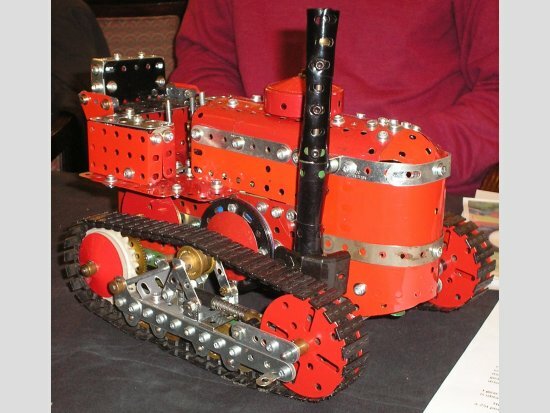 The first modeller on Colin Bull’s round was Mark Rolston with an American 10 wheel Tractor Unit based on CQ No. 76 2007. He has put his own stamp on the model with many improvements, including a fifth wheel coupling plate, and chain drive as opposed to the original belt drive, a new style front bumper and tow hitches front and rear. Mark also showed a Mack artic Tractor Unit. 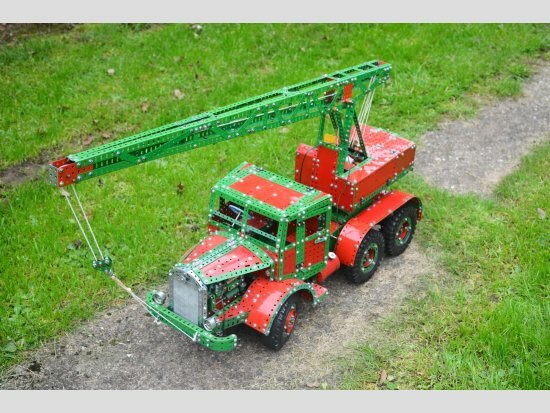 Crane of WW2 Airfield Vintage in red & Green and a Leyland Martian chassis. Moving on down the line is Colin Reid with two 1913, 5 ton Yorkshire Steam Wagons built in Nickel parts and operated by remote control at a Scale 15:1. Not satisfied with one he built a second steam wagon almost a copy using a modern Meccano car R/C unit which also plays some annoying (to me) music. 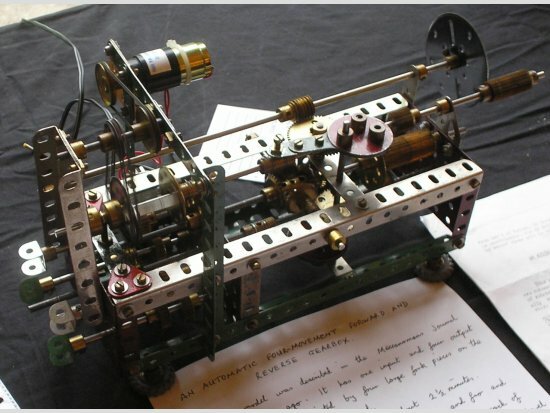 Roger Burton showed an automatic four movement forward & reverse gearbox: the whole sequence takes about 2½ minutes. The timing can be changed by changing the positions of the ¾” pinions on the output shafts. 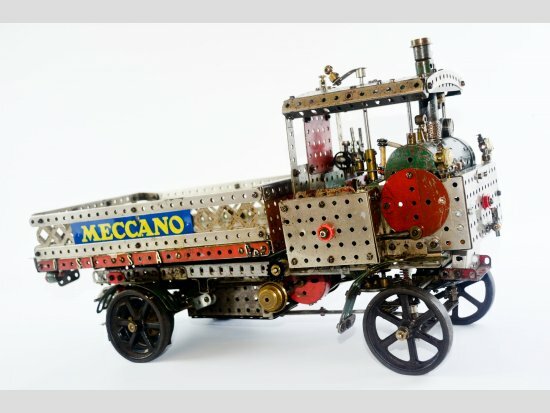 The model is described in detail in the Meccanoman’s Journal from about 50 years ago. Roger also showed a Remagnetising Permanent Magnet Machine used on his Hornby Dublo railway locos. 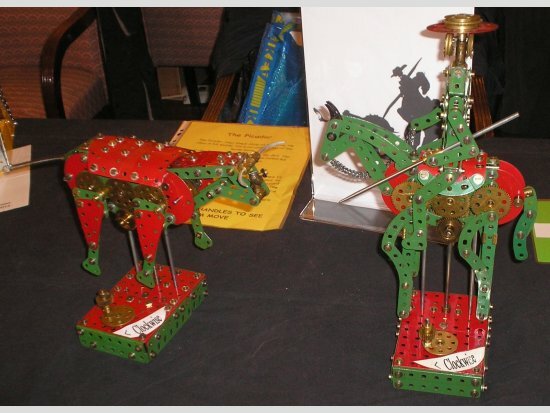 John Rogers takes the next space with two Andreas Konkoly models: the Picador Knight and secondly, the Spanish Bull constructed in red & green. 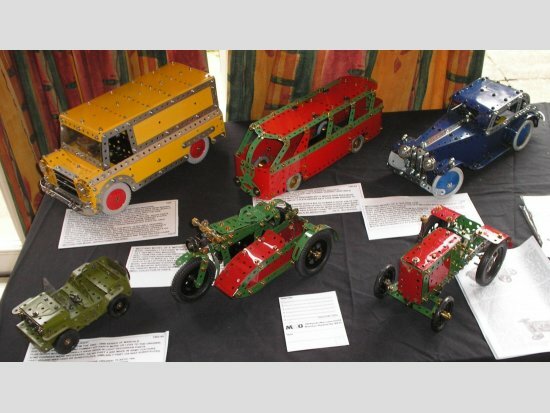 These models are featured in the Runneymede collection of Konkoly models published by Nick Rodgers and RMG. 1929 Steam Engine that has never been used. 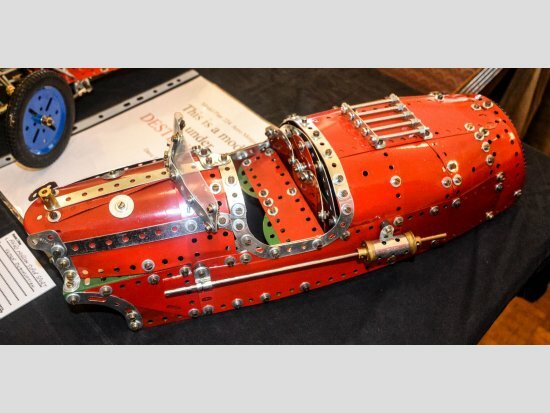 Built in red & green, the motions are driven by a small electric motor that drives the engine crankshaft. Power is supplied from batteries hidden in the underslung water tank. Now a surprise, from Gregg Worwood; I would have expected to see some large model or least one under construction. But no! a small model. What’s up Gregg, run out of parts? It is called a Stronach-Dutton Railroad System Traction. Work is still in progress, in what I think is going to be another great model. It seems that after transport by rail it then becomes a road vehicle to continue to its destination. Large rear road wheels, smaller wheels at the front, rail wheels represented by plastic road wheels Part No A537 bolted to faceplates and on a short, yes! a short length of track. Mei Jones had built the Railway Breakdown Crane ( shown right) featured on the cover of the early 50’s accessory manuals. No instructions were ever published for this model which was first built (Ed.) by Tom McCallum some years ago and described in CQ. Mei has created his own variation, in red & green which looked very convincing. An interesting historical model that deserves greater attention. 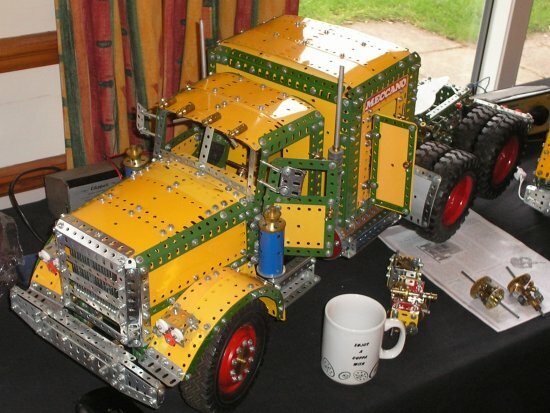 David Hobson is a modeller who shows many other systems as well as Meccano. 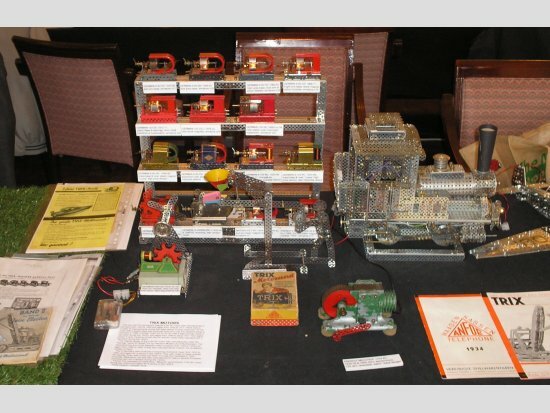 This time we see a display of permanent magnet 4-8V DC Trix Motors manufactured in Germany from 1933-1940, and post war from 1949-1971.These latter ones were much improved from there pre-war counterparts. A further improvement, a12V DC motor on a plastic base, was produced from 1972 until Trix ceased trading in Germany in 1998. 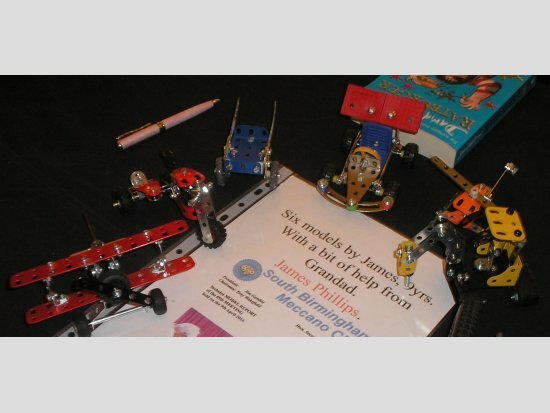 David also showed a 0-4-0 Trix Loco and a ’Tronico’ systems Junkers aircraft. 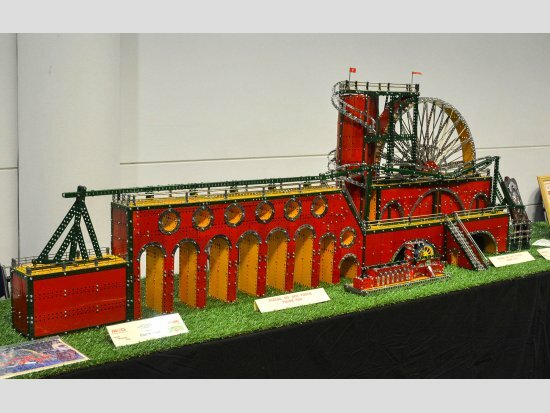 Colin Bull displayed his Winning model of the Laxey Waterwheel as described in the last MMG magazine, complete with’ The John Linder Memorial Shield’ and the Runnymede Award for ‘Excellence Shield’ it also came second at Skegex2016. Pauline Bull also showed a cross-stitch of the Laxey Waterwheel. 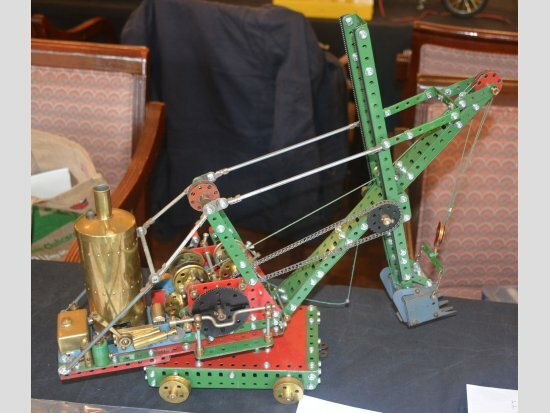 Sid Beckett bought along his Countryman Traction Engine, a model that Sid built about 30 years ago. It has been a great hit at so many shows that Sid has supported over the years. It will pull a youngster on a trailer and Sid demonstrated it in the garden at the meeting. Pete Evans’ masterpiece 1930s Brooklands Garage got a lot of attention at our meeting as it has all through this summer. 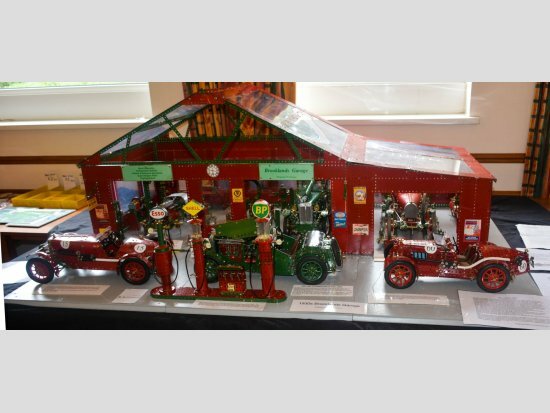 The model is of a typical 1930s motor racing garage at Brooklands in Surrey. Pete has built four complete and one partial 1930s MG cars and one Type 35 Bugatti. Each one being a work of art in itself. The garage building is adorned with most of the garage equipment typical to that period. 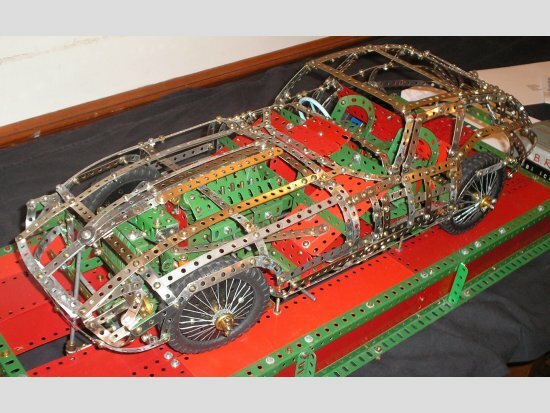 Tony Wakefield’s signature strip built motor cars are now a feature of our meetings – this Jaguar E-Type Series 1 Coupe was to a 1:6.5 scale car mounted on a medium red/green plinth. The body of the car was built in skeletal form with narrow strips but very closely achieved the beautiful shape of the actual car. Tony had incorporated an engine, gearbox and differential and although these did not run, the captivating surprise of this model is that it had a power lift bonnet. New Cavendish Vol 6 by Bert Love and Jim Gamble on plate 4. 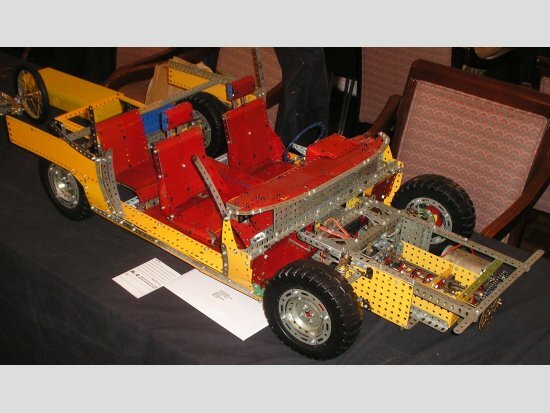 It has added steering and leaf springs but is a model still in development. Still under construction Dave Bradley bought along his ¼ scale Lamborghini Espada inspired by Pete Wood’s (RMG) Lamborghini Contach. 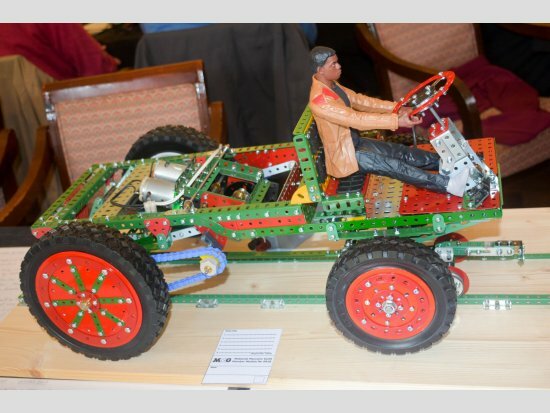 The model is at the rolling chassis stage and has gearbox/differential and steering wheel and seats. It will be great to see the two ‘Lambos’ side by side when the Espada is complete. Returning to his more traditional (better Ed.?) modelling skills set (but not leaving his plastic dragons at home ) Geoff Devlin revisited an old theme with an 1896 Internal combustion Tram . 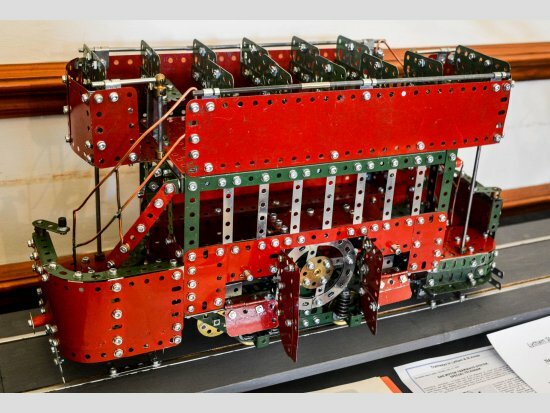 This very early internal combustion powered tram ran on coal gas and is built to a scale of 1:17. 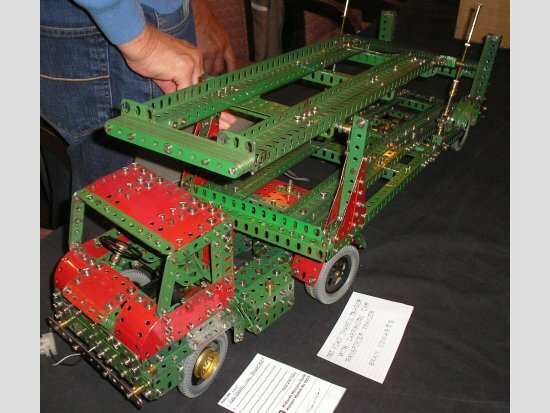 This is a well built model in red and green and runs along a tramway line. Geoff also showed a Speed Play 9902 Dragon which looked impressive but was difficult to build for its’ intended 7 year plus modelers. Geoff pointed out several shortcomings with this model system. 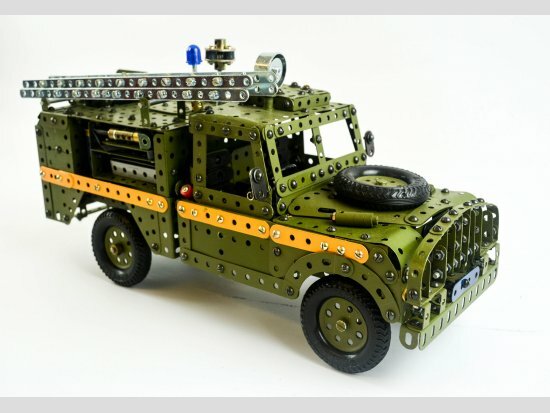 1972 RAF Truck Aircraft Crash Rescue vehicle built in Army green Meccano. One of a huge number of this type of vehicle expertly modeled by George over the years. 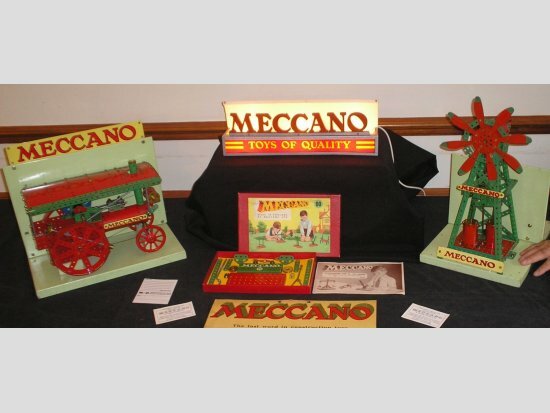 Roger Marriott bought along another Meccano Dealer Display , built by the Meccano factory around 1965, it was designed as an eye catching way to advertise Meccano. 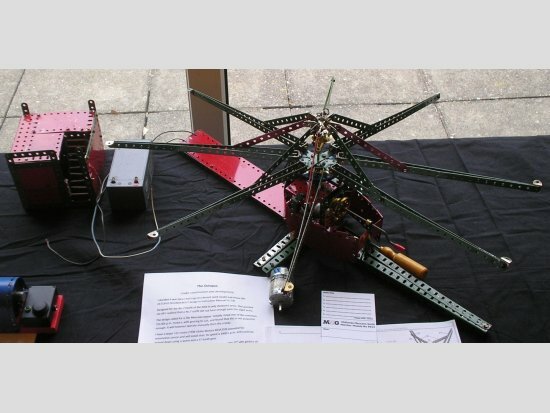 It consists of rotating signs rather like TV “screens” and four demonstration mechanisms operated by a chain and gear drive assembly all driven from a FRACMO motor enabling four rotating “screens” with various Meccano advertising slogans – such as “a new toy every day”. At some time in its life the model had been “improved” by the addition, to the rotating signs, of illustrations taken from Meccano advertising leaflets. Roger thinks this was probably done by a bored shop assistant for amusement. 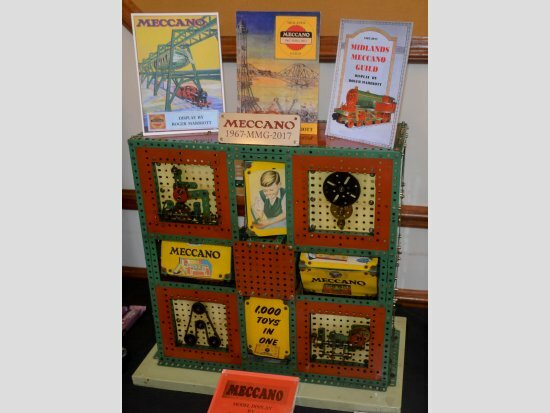 (Also seen on the model is the 50th anniversary metal Meccano sign we will be providing to each member as a momento of our 100th meeting in March 2017). 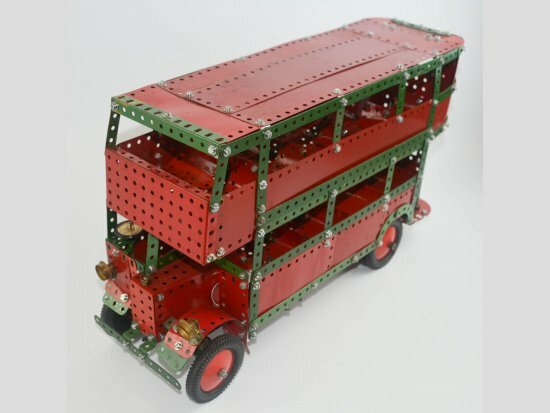 Brian Edwards displayed his 1960 Ford Thames Trader tractor unit with Carrimore Car Transporter Trailer modeled in medium green/red. All the character of the period is achieved in this model. The tractor contains an electric drive and the trailer has a motorized upper deck raise and lower. John Reid and Dave Phillips are making brave attempts at Terry Pettitt’s 1934 Aero Morgan Super Sport ( featured in the MWMO MMG series). Both are work in progress but fairly advanced with a rolling chassis that looks more or less complete. The model has a direct drive transmission to the back wheel and will have steering. 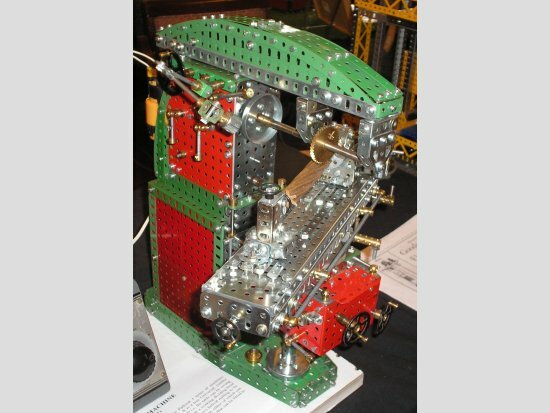 Dave’s model, slightly more complete, incorporates homemade aeroscreens and a revised motor drive. 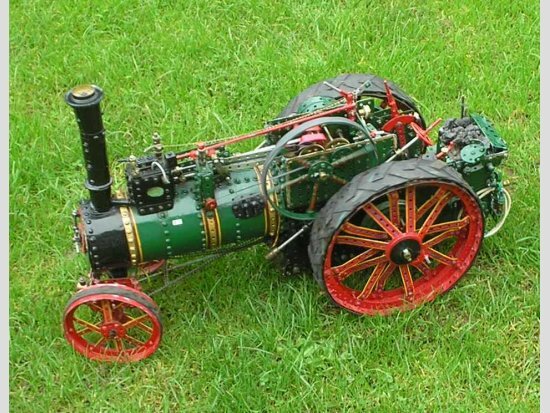 The model is built from a mixture of Meccano colours/periods but has a nice predominantly red and zinc body which looks finished. John added a diorama (above) with a workshop scene that he says is his wife’s idea. 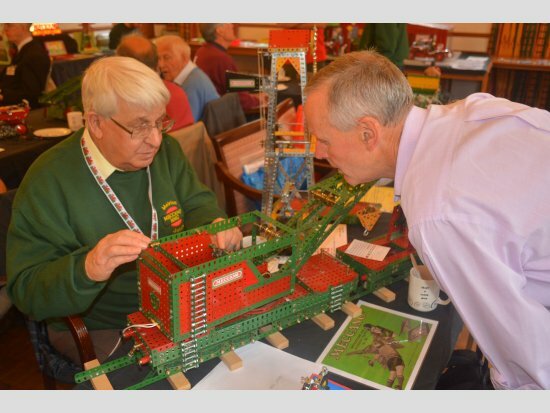 Dave’s Grandson James Philips was the youngest (9 years) modeler on the day and showed a selection of six models which he has built. They include a racing car, helicopter and digger. All the models had been finished to a good standard of build. (above). 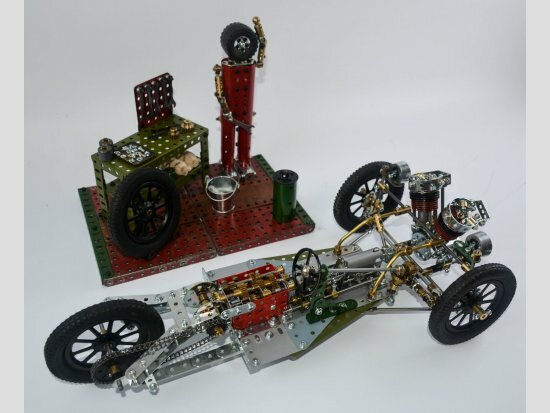 Terry’s has now got to the rolling chassis stage with this model. 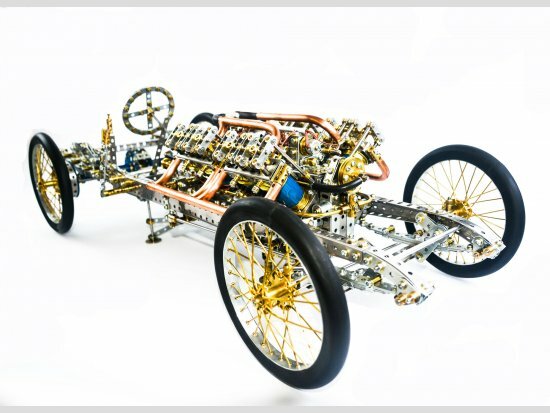 We all marveled at the quality of the V8 engine a year ago and now the rolling chassis is of equal quality. The model is to a 1:5 scale. The engine was turning with all 16 pushrods doing their stuff. The back wheels were turning as was the clutch and gearbox. The spoked wheels are to Terry’s design and manufacture and we are sure to see this design emulated in the future. John Molden always arrives early, with his wife, and gives much valued help in setting out tables and also clearing away at the end. This is a chore and more help would be very welcome both clearing and setting up for the meeting – it doesn’t happen by magic! John showed his Volvo FH12 Tractor Unit and trailer front axles unit - a beautifully built and complex model having a 6 speed gearbox, clutch and working Hi-ab crane unit. 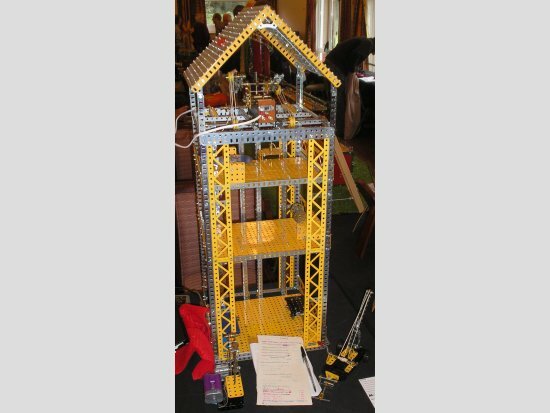 Relatively new member Carl Gill had developed the SML Goods Warehouse with Elevators to provide a model built in Yellow/zinc from a Meccano instructions but including some personal touches such as a table and crane. John Palmer gave very helpful assistance to our outgoing treasurer in collecting subs and so did not have much time for discussion about his model. 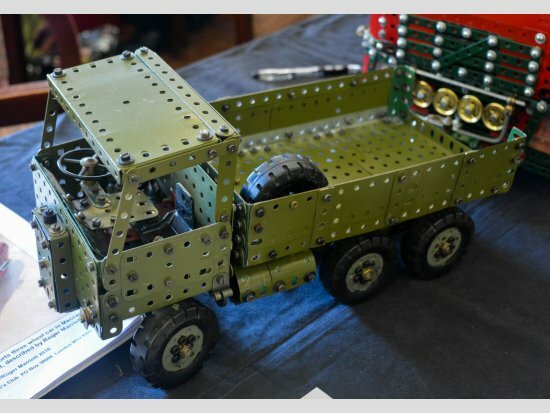 Built using Army green parts, John’s 6 x 4 Lorry is a freelance model using ex John McDonald wheels. 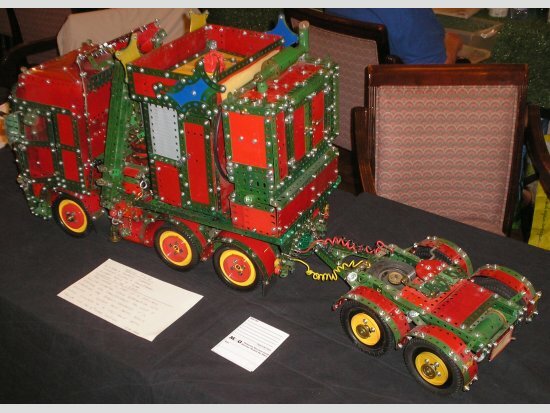 Terry Pettitt, unfortunately suffering from an eye injury never-the-less managed to attend and show his exceptional Crawler Tractor. Based on a Fowler/Field Marshall Tractor. 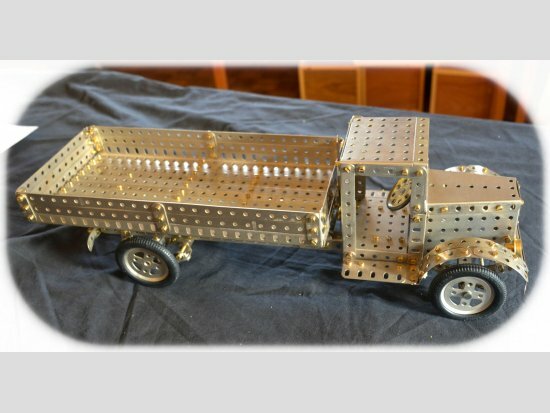 It is his own design using the Meccano plastic track links and incorporates motorized 3-speed drive with brakes either side used to operate the steering. This model looks really good fun to play with. 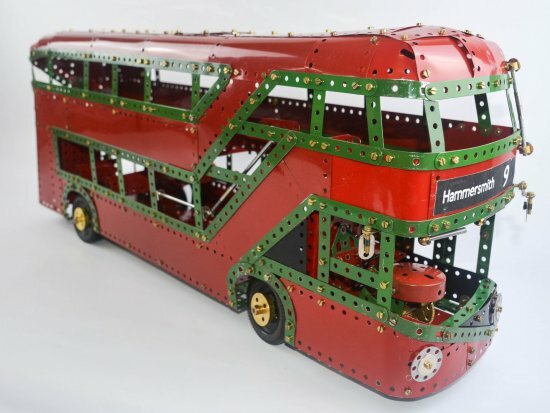 “Busman“ Michael Bent a showed Double Decker Bus built from red and green. The model based on a No.8 Manual model has a direct drive for forward motion and has working steering. scale which allowed the use of 2" pulleys for the wheels. How this model is built from a No.9 set is amazing. If we have missed you apologies but……..